Tree plantation companies have enormous power and impunity in Chile. The fires of 2017 demonstrated the collusion between these companies and public officials to prevent investigations and criminalize the Mapuche indigenous people. It also seems they are the main beneficiaries of the fires. Some of the materials submitted included: testimonies from ex-guards linked to surveillance companies on forest lands; confessions by workers who were paid to commit arson and incriminate Mapuche leaders; incomplete examinations and abandoned legal cases related to forest arson and mercenary groups; former agents of the military dictatorship’s intelligence service providing surveillance services to companies; public testimonies by parliamentarians; investigative reports; and legal opinions. 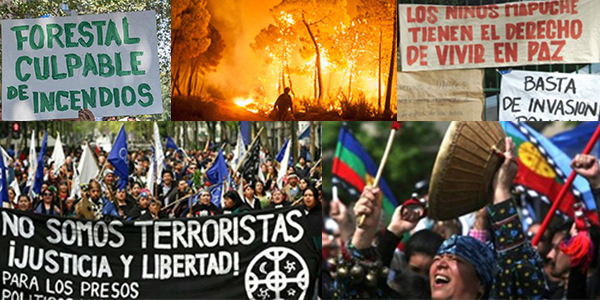 They also submitted information on the relationship between plantation fires and pests; the existence of mercenary groups aimed at criminalizing and repressing the Mapuche people; and the insurance payouts and collusion among the business, political and justice sectors of the Araucanía region. It is inconceivable that the Public Ministry has not yet established lines of inquiry to determine actions and responsibilities related to the interests of plantation companies—in particular the companies Mininco and Arauco. Instead, with bias and racism, prosecutors have preferred to launch an open persecution of the Mapuche people. Following the allegations, the Prosecutor’s Office decided to carry out an investigation in the Bio Bio and Araucanía regions. However, there has been no investigation to date. It is clear to the organizations that the State Defense Council did not want to take action because there are conflicts of interest. These organizations denounced that Council President (Juan Ignacio Piña Rochefort) was a trusted official of former President Sebastián Piñera during his term; Piñera, in turn, has a close relationship with logging companies. The former president was a partner in Antar Chile—of the Angelini Group’s forest holding—and he maintains a close relationship with the Matte Group of the Mininco logging company. It is also impossible to ignore the networks of corruption with broad sectors of the opposition and with pro-government sectors, including several officials linked to the Bachelet government and the companies. “The State Defense Council merely washed its hands [of the matter],” the organizations said. Following the press leaks, the Prosecutor issued a public statement denying such an investigation and stating that “The investigations today are focused on other issues, which does not mean that if serious and specific allegations exist about possible wrongful insurance charges due to the presence of the wasp, they will not be investigated with the same rigor and professionalism with which all claims received by the Public Ministry are investigated.” (18) The refusal to investigate confirmed the allegations that indicate complicity between the Public Prosecutor and the companies. The Public Prosecutor’s Office of Chile—a supposedly autonomous institution whose role is to direct investigations into crimes, bring the accused to court if necessary, and provide protection to victims and witnesses—faces accusations of being party to and an accomplice in the crimes related to plantation companies. Said accusations link its officials with the interests of these private corporations. The State Defense Council faces a similar situation. This entity prefers ommissions and prefers not to fulfill its obligations, despite having the ability to do so. It has allowed crimes that were committed in the context of the mega forest fires go unpunished—crimes that have razed south-central Chile in recent years. People are sustaining a constant resistance to the industrial forest model in several territories. In a meeting held in Temuco in May 2018, it was announced that the denouncements will continue at various political and human rights bodies, at the local and international levels, in order to put an end to the impunity.